Week 2 already?! YAY! How was your quilting this week? Did you see @sewbrainy's practice piece in my newsletter on Saturday? I'm so excited that she shared it. You can share your work, too, by tagging your Instagram pictures with #MachineQuiltingBlogHop. In other exciting news, Martingale has The Ultimate Guide to Machine Quilting on sale all month, so if you still need a copy, hop over to their website! 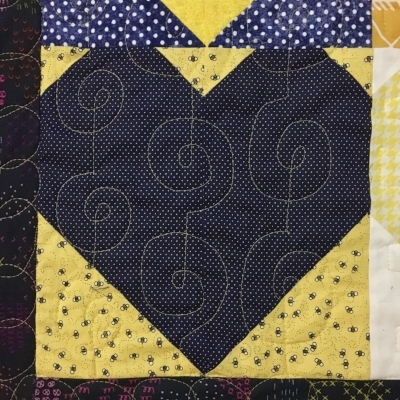 This week's quilt was called Choosing Colors (pictures from Christa's blog). It has added several more stitches to our toolbox. And, as I said last week, I'm committing to quilting 5 days a week and recording my progress each day, so let's get started! The #MachineQuiltingBlogHop went live today, and it has been so much fun already! Thank you, everyone, for your support and encouragement!! Today I practiced three stitches: pebbles, switchbacks, and ribbon candy. I was feeling uncertain about my pebbles, but then I compared them with a sample swatch I made at the end of March. I still see ways I want to improve, but it was encouraging to see that I have already made progress. Switchbacks are beginning to feel natural. The tricky things with those (and with ribbon candy) is moving my hands slowly enough to be smooth and accurate but keeping my needle going quickly enough that I don't end up with "toe grabbers." This quilt, my Georgia E Pluribus Unum Quilt, is also constructed with some contrived raw edge appliqué layered on muslin, so it has some really thick spots. oi. Then, ribbon candy. I love how it looks, so I'm determined to get the hang of it. But it's really messing with me, y'all! Time to follow Christa's advice and do some more drawing!! On the whole, I'm pleased with today's practice and completely overwhelmed by the response to the hop. Maybe we should have called it the Machine Quilting Blog Party!! I made more progress on the Georgia quilt today. Pebbles are feeling less awkward now. As I hinted last night, I spent some time drawing more ribbon candy, too, and that is slowly helping. Practice makes progress! I also did a couple more square chains on the #OperationSmiley Quilt that I started last week. I want to be sure I don't just leave designs from previous weeks behind-- by continuing to practice them I will build muscle memory and make it easier to utilize those motifs in the future. I only did about 15 minutes of quilting today because I've been working on tshirt quilt orders. Still, a little practice is better than no practice, and I got about half of a column quilted on the #OperationSmiley Quilt. The two tshirt quilts I was focused on are nearly done, and I took a couple of days off from machine quilting to work on the Florida quilt and some pattern diagrams. Today I was nose to the grindstone-- I spent 4-6 morning hours with the tshirt quilts, then shifted gears in the evening to machine quilting. First, I switched from the metal darning foot I've been using back to the clear plastic embroidery foot that I also have. In the past, the hopping of the embroidery foot has really bothered me, but something with the darning foot's alignment makes it easy to hit with the needle when I'm pulling threads through, and I'm tired of breaking needles. But I digress, back to quilting. Another practice progress shot (left to right). While the ribbons I've done over the week may not look shockingly different from each other, my comfort level has changed a lot, and that's another important part of practicing! First up, I took a practice sandwich and gave the wood grains design a try. it turned out a lot better than I expected! The shapes made sense to my brain, and my stitches are even pretty even. Woohoo! Then, I spent the rest of my time finishing the quilting on the fifth #OperationSmiley Quilt. I finished the second column of square chains, then jumbo sized the spiral chains for the final column. Lastly, I added a ribbon candy border-- and it even looks pretty good! I guess all that practice this week paid off! I forgot to take a "victory lap" around the quilt before I started the borders and quickly regretted it. Even though I baste well, without those stitches to hold the border steady, I was getting all kinds of waves and pleats. I paused, went back and added the victory lap, then finished the ribbon candy without further hiccup. I hope I can trim and bind this quilt tomorrow so I can put a nice picture in here! Sunday night-- here we are! How is that possible already? I worked on a couple more things tonight. Unfortunately, I made but didn't get the binding on the #OperationSmiley quilt, so y'all are stuck with another sneak peek shot of the back until I can get it bound and properly photographed tomorrow. I did some more work on the Georgia E Pluribus Unum Quilt tonight. I did woodgrain quilting transitioning up to some long straight lines on one side, and I'll do the same on the other side soon. I think the top will be swirls. There are swirls in the fabrics that are just begging to be in the quilting, too. That's it for now, friends! As always, you can see my daily work on Instagram @stringandstory. You can also get all the links you need for all the blog hoppy goodness by visiting the Blog Directory. Be sure to read the other posts by Jen, Vicki, and Kristin!